Experience wireless freedom and amazing sound quality with the Bluetooth-enabled Urbanista Berlin Fluffy Cloud earphones – complete with a microphone and volume controls. The Urbanista Berlin Fluffy Cloud earphones take just a little over an hour to charge – then let you immerse in your favourite tunes for 4.5 hours. The Urbanista Berlin has soft silicone earbuds for a snug, comfortable fit, and silicone wing GoFit earbud-replacements, ideal for sports. Plus with a Bluetooth connection, built-in microphone and controls, you can manage your music and calls without fumbling for your phone. Enjoy the Urbanista Berlin's amazing audio quality with crisp highs and a rich sound. Whether you're listening to your favourite songs or simply talking to a friend, these earphones will give you an extraordinary listening experience. The Berlin earphones take slightly more than an hour to fully charge and keep you company for more than 4.5 hours. 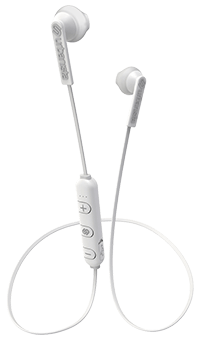 And for extra functionality, you can join the earphones together magnetically and wear them around your neck when you're not using them.